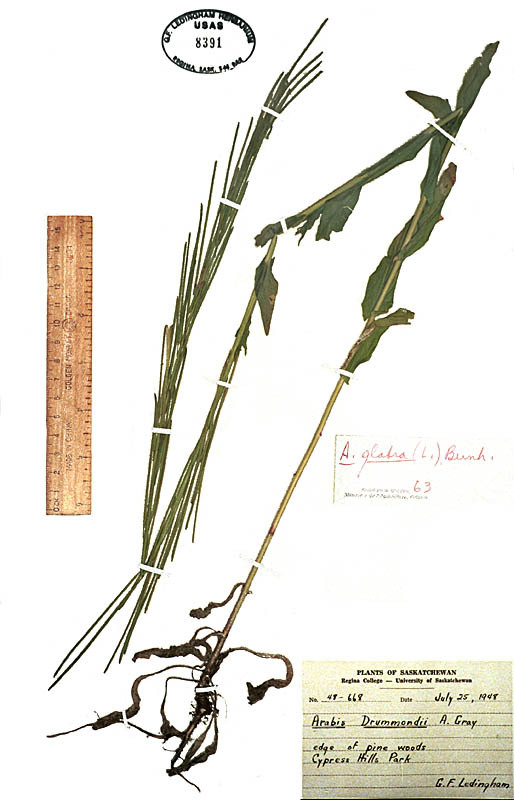 Glabra: Answers to key questions in Budd's Flora and Flora of Alberta leading to this species. Arabis: Answers to key questions in Budd's Flora and Flora of Alberta leading to this genus. Note that Budd's Flora (BF) requires the flowers to be both yellow and greenish to yellowish white. Flora of Alberta (FOA) requires the petals to be white or purplish, not yellow. In fact, the petals are greenish or yellowish white, occasionally with purple tips. Note that Flora of Alberta (FOA) requires the pods to be flat. In fact, they are almost circular in cross section. Cruciferae: Answers to key questions in Budd's Flora leading to this family.